“The National Latina Business Women Association of Orange County is holding a Hispanic Heritage Month breakfast and fashion show,” according to the O.C. Register. The event takes place Wednesday, Sept. 16 at Nordstrom, at Westfield MainPlace, 2800 N. Main St. in Santa Ana. Check in begins at 7:30 a.m. at the second floor sky bridge, and doors open at 8 a.m.
A continental breakfast buffet will be served, and a fashion show begins at 8:30 a.m. Cost is $10. Established in July 2004, the Orange County chapter of the National Latina Business Women Association (NLBWA-OC) was created to meet the needs of the growing ranks of Latina Entrepreneurs, Executives and Professionals. “In September 1968, Congress authorized President Lyndon B. Johnson to proclaim National Hispanic Heritage Week, which was observed during the week that included Sept. 15 and Sept. 16. The observance was expanded in 1988 to a month long celebration (Sept. 15 – Oct. 15). America celebrates the culture and traditions of those who trace their roots to Spain, Mexico and the Spanish-speaking nations of Central America, South America and the Caribbean. Sept. 15 was chosen as the starting point for the celebration because it is the anniversary of independence of five Latin American countries: Costa Rica, El Salvador, Guatemala, Honduras and Nicaragua. In addition, Mexico and Chile celebrate their independence days on Sept. 16 and Sept. 18, respectively,” according to the U.S. Census Bureau. 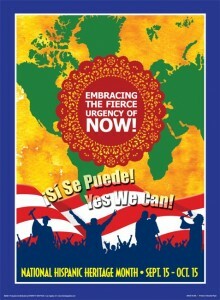 Click here for the official 2009 Hispanic Heritage reading list, which is being used by schools across the nation.